Kagonin is a new science-fiction print-on-demand collectible card game for ages 12+ created by Erik DePrince & Jessica Volinski and printed by TheGameCrafter.com. 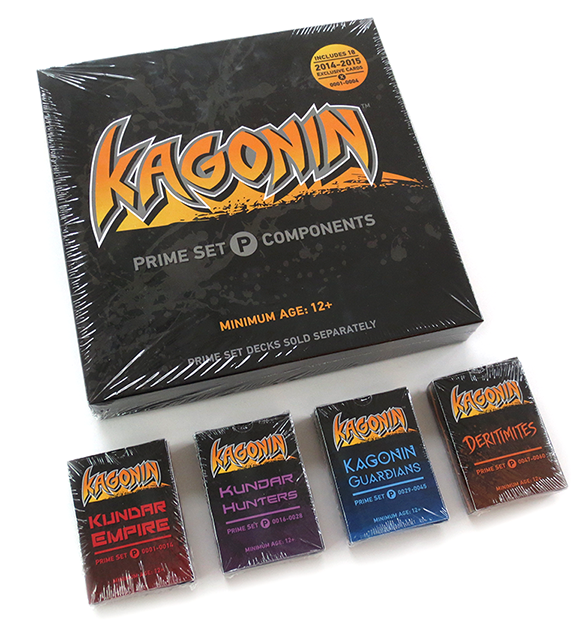 Kagonin launched in December 2014 after more than 10 years of development with The Complete Prime Set, a comprehensive introduction to the game which includes over 300 game components and 234 unique full-size cards in 4 pre-constructed decks and a 40 page rulebook. Erik and Jess will be releasing new expansions packs and single card monthly starting in January 2015. Everything about the game- all art, card mechanics, graphic design, writing, you name it- is created entirely by Erik and Jess. New products and deck expansions are already in development and will roll out frequently through 2015. We understand the more cards players have to build decks with the better so expect to see single cards, limited edition cards, expansion packs, promotional fan cards, and more coming very soon. As a print-on-demand game, everything is printed to order and will be sent directly by TheGameCrafter.com. The print-on-demand model not only allows Erik and Jess to create new products much more frequently than they could with traditional printing, but it also allows them to offer special cards in smaller, more limited quantities that would never be economically possible with traditional manufacturing. In short, the print-on-demand model has informed every single aspect of this game, from how the cards are organized, to how the products are packaged, to how new cards will be released. With such a quick turnaround time between the creation of new cards to getting them in player's hands, the creative possibilities for Kagonin are truly endless. And The Prime Set is just the beginning. Unlike many card games, Kagonin does not use rarity types. Instead, Kagonin has its own unique card organization based on the types of cards and how they're released. In an attempt to do away with the idea of "filler cards", Erik designed every card to be useful to someone. And if a card doesn't seem too useful now, its probably because it's connected to other cards he's got planned that haven't been released yet. In the bottom right corner of each card is a an ID number with a letter: P, E, T, S, L, or X. The Prime set is the core of Kagonin. Each year the Prime Set will be updated but it will remain the constant entry point for players new to the world of Kagonin. It comes with all the components needed to play including the battle boards, charge counters, and tokens. Expansions will be released regularly and have a variety of general cards of each color. Building on themes in the Prime set and the Expansions, Themed Editions will dive deeper into specific card mechanic themes. Singles will be a huge part of Kagonin. Erik is constantly creating and illustrating new cards. If he has a great idea for a new Kundar card he'll probably draw and design it and have it ready to go in a week. That's how fast he wants to get new ideas out of his head and into player's hands. Single cards will be available for sale right here shop.kagonin.com starting in Early 2015. Limited Edition cards will be announced in advance and only available for sale on shop.kagonin.com. Once they sell out that's it- you won't be able to get them from us again. Each year the Prime Set will be updated to have a new Exclusive Card pack. Expect that Erik will be doing lots of cool stuff for players including special giveaways and promotions. Like the Kagonin fb page or follow @erikdeprince or @queenofkagonin to stay up-to-date. We're a very small operation- exactly 2 people- so please bear with us as we get everything up and running. Our main objective was to get the game released so that's where most of our energy has gone. The website is still a work in progress we envision it as being the central hub for all things Kagonin. Currently the Archive is up-to-date with all cards released to-date and that's a great place to plan your deck, ask questions, and make comments. Many of our products, including The Complete Prime Set and Expansion Packs, will be available to purchase at TheGameCrafter.com. However starting in early 2015, players ail also be able to buy single cards and limited edition cards directly from us at shop.kagonin.com. Orders placed at TheGameCrafter.com will ship from them and orders placed at shop.kagonin.com will ship from us. The 2 stores will have different products for sale and we'll be sure to make it clear where each new product can be purchased from when it launches. The Archive is a great resource and our central database with direct links to where you can purchase each card and new product release.